Winter Flowering Trees: There are fewer trees to choose from that bloom during the coldest time of year, but the choices are beauties. Cornus mas, corneliancherry dogwood, Zones 4-7. The tiny yellow blooms that cover this small winter flowering tree before the leaves emerge create a lovely glow to herald the approach of spring. Makes a nice specimen or screen and is most effectively using against a darker background to showcase the spring color. Cornus officinalis, Cornel dogwood, Zones 5-8. 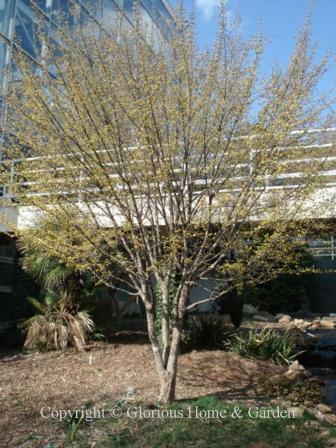 This late winter to early spring blooming member of the dogwood family is similar to Cornus mas and blooms at the same time, though the flowers are a little showier and the bark is more ornamental. Magnolia zenii, Zen's magnolia, Zones 6-8. This winter blooming magnolia, from China, is a recent introduction to the United States, and is one of the first magnolias to bloom (January to February) with flowers similar to M. X soulangeana and fragrant. Parrotia persica, Persian ironwood, Zones 4-8. 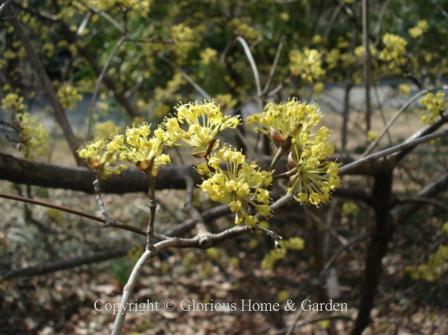 This member of the witchhazel family is an outstanding small winter blooming tree or large shrub that deserves wider use. Not only does it provide winter flowers of deep red (though small, actually the stamens) that are long-lasting, but the new leaves emerge reddish-purple, it has beautiful exfoliating bark, and the fall color is outstanding too. A tree for all seasons. 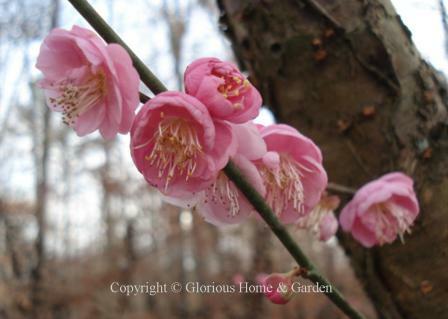 Prunus mume, Japanese flowering apricot, Zones 6-9. 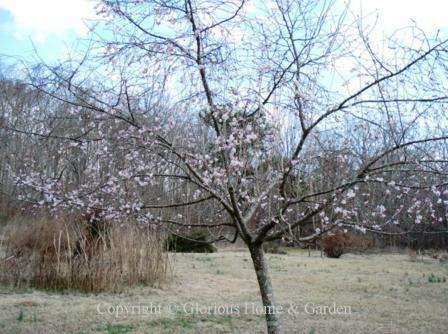 An interesting small winter flowering tree that produces pale pink winter flowers on bare green branches. 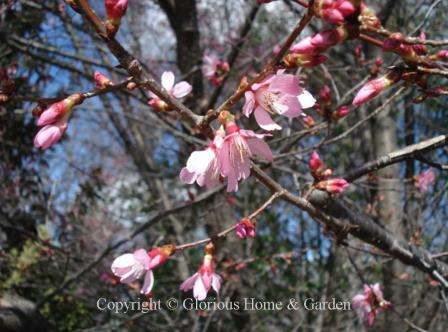 Prunus 'Okame,' Zones 6-8. One of the loveliest of flowering cherries for winter and one of the earliest to bloom is 'Okame,' a hybrid between P. campanulata and P. incisa with lovely deep pink blooms and greaterhardiness from its P. incisa parent. Prunus subhirtella var. autumnalis, autumn flowering cherry, Zones 5-8. Some of the delicate pale pink flowers open in the autumn and sporadically during a mild winter to finish with a flourish in late winter to early spring. A lovely winter flowering tree to use as a specimen in the garden.